Real estate prices keep jumping in Inglewood. The National Football League is back in Los Angeles. Not only does L.A. now have two professional football teams, the Rams and Chargers, it also has a new, $2.6 billion stadium currently under construction in the heart of the Inglewood neighborhood. Ever since the Los Angeles Stadium at Hollywood Park was first announced, many have focused on its mammoth cost, the initial battle with the Federal Aviation Administration to approve the project and even the year-long delay in opening due to record rainfall, but few have questioned what it’ll do to the real estate of Inglewood, which was named Curbed Los Angeles’ “Neighborhood of the Year” in 2014. Using the latest data from Zillow, GOBankingRates analyzed five-, three- and one-year changes in key real estate characteristics in Inglewood and compared them to the same characteristics for the entire L.A. metro area. One of the simplest criteria to evaluate real estate is in terms of median listing price. Inglewood has seen an increase in median listing prices in the past five years, as has most of Southern California. But upon closer examination, one can see just how much Inglewood has outpaced the Los Angeles metro area in which it is located. Since it was first rumored that the new stadium would be built in Inglewood five years ago, median home listings in Inglewood have risen 83.36 percent from $299,900 in January 2014 to $549,900 in February 2019. Compare that to an increase of 39.8 percent for the entire Los Angeles metro area. Even when we tighten the scope, Inglewood has outpaced the rest of Los Angeles in terms of median listing price. In the years after the stadium actually broke ground in 2016, Inglewood listing prices have outpaced the L.A. metro area by $96,899, or 34.29 percent. This trend continued into last year with Inglewood’s median listing price rising 7.3 percent and Los Angeles’ only rising 0.58 percent. While the median list price for a home in Inglewood has dramatically outpaced Los Angeles, there might be some hope when it comes to the median rental listing price for a single-family residence. Rent in Inglewood is still cheaper than the Los Angeles metro area, with the average single-family residence in Inglewood costing $2,845 a month, compared to $3,495 a month in the rest of Los Angeles. In the past year, rent has increased 6.07 percent across the L.A. metro area, while only increasing 5.47 percent in Inglewood. This will be of little consolation to residents, however, as the demand for real estate in Inglewood continues to increase. Along with the new football stadium, residents of the area will finally see the arrival of the delayed Los Angeles International Airport (LAX)/Crenshaw rail line in the same year, making homes and rental properties in this area even more attractive to outsiders. Couple that with the proposed new Clippers Stadium and the revolving-door of projects that plan to transform LAX into a “truly world-class airport,” you have a neighborhood that has all the right ingredients for a prosperous future. Unfortunately, for the people that already call or want to call Inglewood home, this means prices will only go higher as more of these projects come to their completion. Keep reading to see what you can get in every state for the price of a California home. 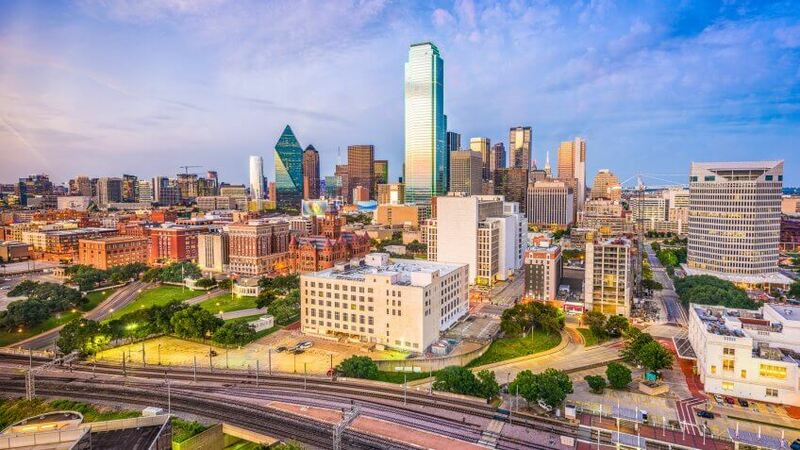 America's best housing market might be the Dallas metro area.